This is only one of many concerns shared by Vancouver’s potential laneway house owners. Space (or lack thereof) can be a significant roadblock for anyone looking to build a small home. Some apprehension is understandable when downsizing your living space. The second part of our laneway house series seeks to put these anxieties to rest. One of the most important considerations for any potential resident of a laneway house is space usage. Therefore, we have taken some inspiration from our very first laneway house and highlighted some general space-centric features. Convertible spaces. Due to their size, laneway houses must often make use of multi-purpose spaces. For our clients, we designed a hallway adjacent to the bathroom that—with the slide of a door—converts into a dressing room. This gives our clients a convenient space to get ready for work every morning. Recessed bookshelves integrated into thicker wall assemblies. Sitting room that offers built-in storage that integrates with the kitchen cabinets. Metal box cabinets recessed into the wall of the bathroom. Custom drawers for shoe storage built under the staircase. Vertical space. Building up and not out is an excellent concept in space conservation. Lofts use the same principle. In our laneway house, the mechanical room, which houses the boiler and central vacuum, is designed to fit above the garage, saving precious floor space. Using vertical space also gives a small space the feeling of openness, which is very important in a laneway house. Psychology. How and why space is used in a home is addressed by our attention to psychology of space. Sensitivity to proportions also allowed us to design an upstairs area that provided unobstructed city views. Psychologically, we separated the floors based on their intended use: The upstairs kitchen and living area was designed as a “public” space in which our clients could entertain; the downstairs area was intended to be used as a private “retreat” for our clients. Green roofs. Unique to our laneway house is the addition of a living roof. Besides providing insulation and aesthetics, green roofs can add more green space to a laneway house. Many studies have shown the positive impact of urban green space. Adding green space. Because a laneway house takes up area on an existing property, there may also be concerns about how outdoor space will be affected. More often than not, laneway houses are built where concrete parking pads or detached garages once were. Our laneway house actually takes up less space than the parking pad that existed before it. All of this “leftover” space can then be transformed into green space! A small yard with a plum tree. Herb and downspout gardens that characterize the north and west sides of the house and suit the owner’s desired outdoor activities. East and south views of tree-lined Vancouver neighbourhoods. Complementing greenery surrounding the building itself. Living in a small home does not have to mean making huge sacrifices. By balancing thoughtful and discerning design with a client’s wishes, laneway houses can support exceptionally comfortable lifestyles. Yes, even in Vancouver. Part 3 in out Laneway House series is out October 5th! Don’t miss it! Curious to see how we’ve taken thoughtful design from concept to completion? Come visit us on October 19th as part of the Vancouver Heritage Foundation’s Laneway House Tour! For more information and how you can purchase tickets (all proceeds benefiting the Vancouver Heritage Foundation), click here. 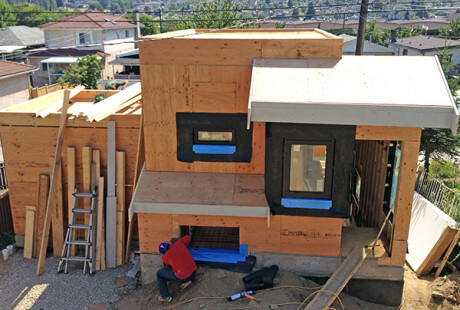 As Vancouverites are accepting living in a denser city, interest in laneway houses is increasing. The City has proposed recent amendments that would make eligible lots across all single-family zones. Prerequisites such as fire lane access, lot width and maintaining access to a back laneway must be met before building begins (check out City of Vancouver for more information). Laneway houses are small homes that are built at the rear of existing properties, open onto a laneway and include both a dwelling unit and parking. The size of a laneway house is based on the size of the actual lot (to a maximum of 900 square feet). They remain under title and ownership of the primary residence and are allowed in addition to a secondary suite in the main home. Did you know? Building a laneway doesn’t mean losing green space. Our recent laneway project started with a concrete parking pad larger than the space where the new laneway house is being built. There is actually a net increase in green space! Why are laneway homes so popular? A laneway house is an attractive housing option for various people. Baby Boomers are attracted by the prospect of downsizing and comfortably aging in home. For younger professionals, a laneway house can be an affordable living option. They are also versatile for growing and multigenerational families looking to live closer together. But occupants of these small homes are not the only ones who can benefit. While increasing the property’s overall value, laneway houses can be a source of rental income, which may help to subsidize an existing mortgage. Small living is a recent phenomenon in Vancouver; North Americans are not as familiar with the concept as our European and Asian counterparts. Vancouver residents looking to lower their living costs and ecological footprints have adopted this trend of living with less. A well-designed laneway house can make the most of small living area by using innovative storage solutions, convertible components, and thoughtful connections to the outside environment. Laneway houses have become a great investment opportunity for homeowners and they mark a turning point in the way Vancouverites think about housing for the future: We’re all going to have to be comfortable living closer together. Our laneway project turning thoughtful solutions into meaningful spaces. Stay tuned for Part 2 in our Laneway series when we discuss living solutions for your small home. Coming Saturday September 21st! Crazy about laneway living or just want to learn more? Visit our very first laneway house on October 19th as part of the Vancouver Heritage Foundation’s Laneway House Tour!